Atrocity are heavy. Atrocity strike back with a saga focused on the lost continent Atlantis with all its mystery and myths, presented in brilliant multimedia way. Mysterious and gloomy, Atrocity play "around" Death enriched by classical, epical elements, but also by Modern/New Wave/Gothic influences with catchy riffs and refrains. Let's visit again the lost empire dedicated to Poseidon, starting this time from the other side of the Atlantic shore. Atlantis again (Hubi Meisel - Marshall). 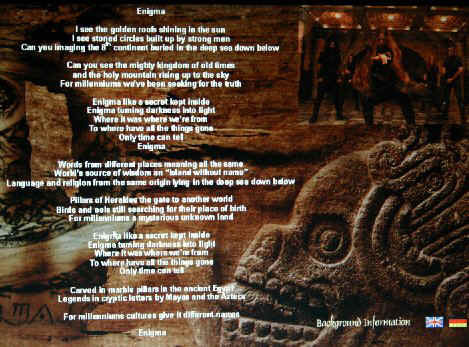 One of the most mysterious myths, is translated into a musical concept again. But don't think it's the same result: Atlantis is different for everyone, always a source for various inspirations. 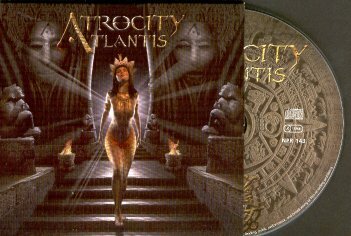 Atrocity, after a rather long break, strike back with a bit unusual Atlantis: the cover art and the image of the famous Maya calendar on the CD makes one thinks at once about the Maya (and Aztec) civilization. 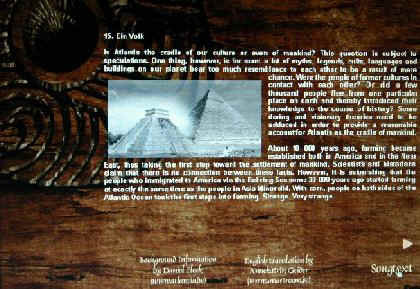 Atlantis as ideal bridge between Europe/Egypt and America? 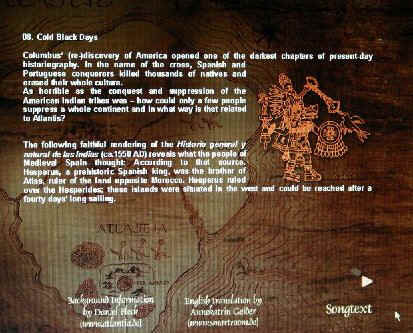 who knows.... And a Maya ambience is the look in which a compendium about Atlantis is presented: awesome! 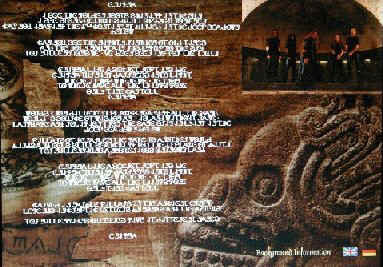 This album IS indeed a multimedia cultural product, that, if put in a CD- rom device, will offer you an astounding show in full screen among music, cultural and historical informations, slideshow with photos of the band, text songs plus the Black Cold Days videoclip. A little nice investigation and personal ideas in music dedicated to the topic Atlantis with background infos which accompany and explain the source of every song. 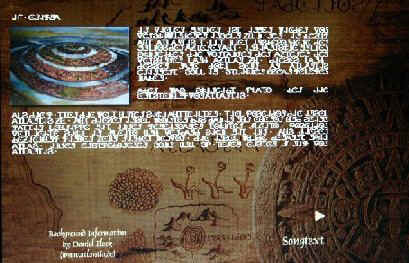 Cryptic letters dissolve and let us access to texts in clear. 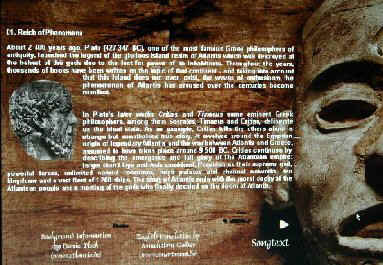 It is Atlantis to be re-discovered, seen and read and not only heard. Welcome into the time of an empire who still makes us dream... Fact is that Atrocity present a various album also if we limit our check only to the mere musical aspect: Death is acting as a bridge between epic and classic elements, between Gothic/New Wave and Modern tendencies. Always gloomy and atmospheric, sometimes bombastic, sometimes raw, sometimes catchy, sometimes sorrowful and sometimes killer. Reich of Phenomena is a brilliant mix about symphonic classic elements and Melodic Death: angry rasping vocals, blasting drums, heavy riffs, catchy nice refrain: mystery, rollercoaster effect, heaviness and energy for an empire which falls from grace. Superior Race, more cadenced, delivers a Death combined with Modern, synthetic influences of the Damned with vocals at the threshold of growling. Good melodic refrain. A Metal which will appeal to a wide target, from Death to Gothic and Industrial. Gods of Nations delivers another mix among Modern and Melodic Death with another persuasive refrain. Like it happens with the 2 previous songs, it is impossible not to want to listen to it again immediately another time. Remarkable the effects of string and sound background. The voice becomes a bit cleaner supported by good backing vocals. Distorted sounds and an able guitar technique and riffing are not missed. One of the best songs of the album. Ichor, song dedicated to the unhappy destiny of the dynasty of gods, is an uptempo which again mixes a certain touch of Melodic Death with the best glamour of the new tendencies, though i cannot say it's not one of the mightiest tracks. But we should even consider the topic with which we deal: a certain timbre of sadness can be found in the refrain. Enigma is a catchy atmospheric and even danceable song , with elements from New Wave. Good piano and bass notes. "Language and religion from the same origin lying in the deep sea". We get back then to gloomy atmospheric Death based lines with Morbid Mind "In my mind morbid hate". A song suitable for headbangers and maniacs. Tempo change and drums with a certain Black appeal. Sacral is Omen, where Platons'words are spoken, supported by a female choir. An omen of misfortune indeed , followed by the catchy Gothic/New wave Club Track and single Cold Black Days, which rocks a lot with its guitar riffs and let us sing along. A song in which, imo, traces of Darkseed can be found, therefore it can be appreciated also by Darkseed listeners. We deal with what happened after that Columbus "(re)- discovered" America. Cold days indeed for the Mayan heritage in loco. This song is no wonder: a kind of easy listening for me, nevertheless a good one!! 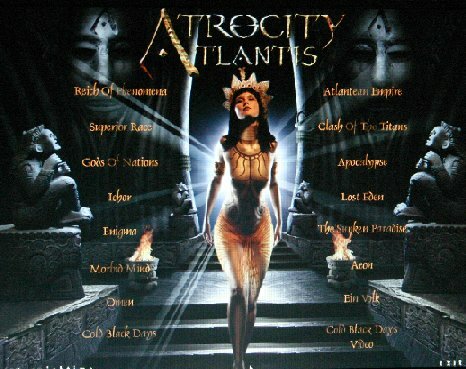 Atlantean Empire is a good and original mix between melodic Death and New Wave/Hard Rock with impure vocals. It resumes a bit the saga while being in the middle of the new style of Atrocity. It is not a killer, nonetheless it is not too easy. Clash of the Titans, dedicated to the war between Atlanteans and Helleans, will appeal to the merciless fans: again a melodic Death as base with much of a killing instinct. Death/Black attitude for Apocalypse and its lost war: a bit bombastic and hymnic and with the right aggressive proceeding. It's here that i think Atrocity could have dared even more!! Sorrowful, instrumental only, Lost Eden is suitable as emotional soundtrack. Connections with Plato and Homer. Atlantis meets somehow Ulysses' Odyssey. The saga goes on changing musical chapter with the many prog facettes of Sunken Paradise. We are sailing away from the lost isle. Around us only the risky Ocean. Another very enjoyable song with again some Darkseed flavors. Aeon or the search for new places where to stay, a new fatherland, maybe many new fatherlands. Elastic tam tam drums, modern distorted sounds, and a mighty lively choir, a bit hymnic with good iterative phrases. It remains in our ears at once, though some points of passage are not the best ones. And the saga ends with a message: Ein Volk (One folk) : a short, instrumental, nicely distorted and reverberating track with a certain psycho attitude and the last spoken words "Wir sind ein Volk": we are one folk. Poor heirs of a golden age, we share much in common. Culture, languages, myths coming likely from one unique origin. Not by chance, it's not a coincidence. I too am firmly convinced about it. Though i will always miss the ATROCITY of Willenskraft, i can only admire this heavy come back, with much care inside, good produced, and propelled by Death, blood of Metal, and by ancient myths, blood of unforgettable culture.